I want to thank you again for this wonderful boy. My handsome russian warrior Viktor Yakov is already 2 years old!! He is very talkative and love to be in our arms. I rescued a 4 year old female labrador x rotweiler in August and in less than 24 hours they were playing together like best friends! 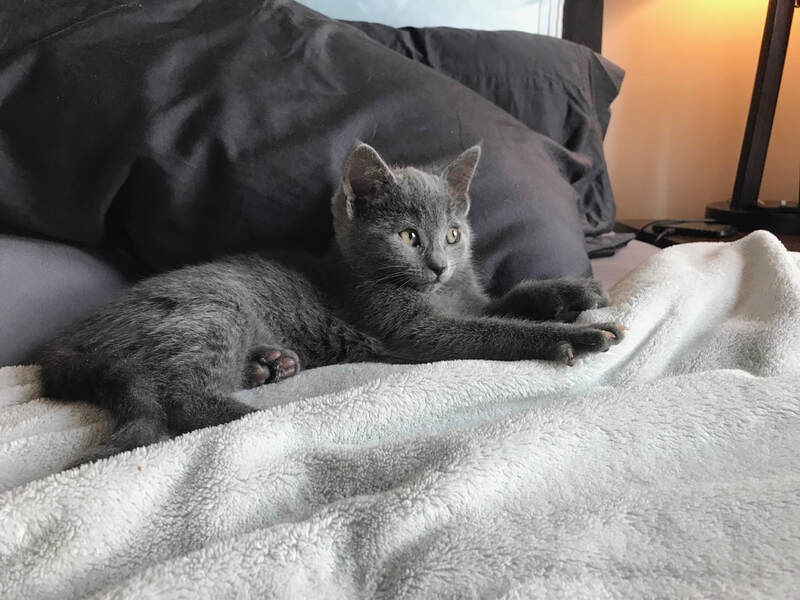 you pickup the kitten to take home, Christine works with each of her clients to ensure that each kitten is placed in the best home possible. 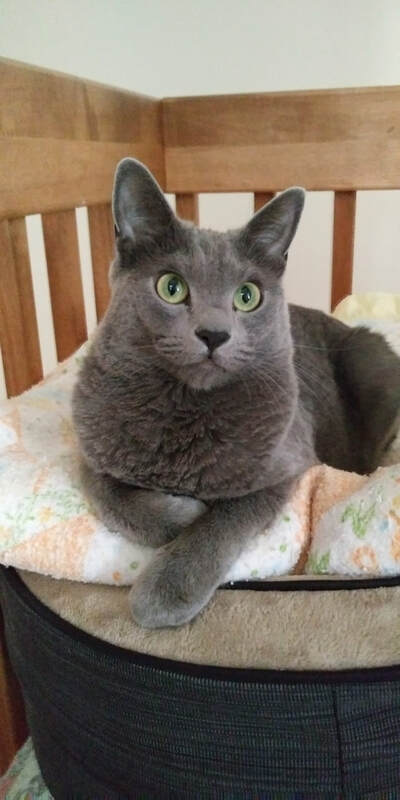 If you are looking to purchase a Russian Blue cat, this is the best breeder in Canada. You should look no further…"
I thought you might enjoy some pictures of Ally! I hope all is well with you! Just wanted to let you know that Yeti's spaying is booked for Friday, July 8th, 2016 and that I'll be sure to ask for the spay certificate from the Veterinarian and then e-mail it to you that week! I also wanted to thank you so much for such a beautiful, smart, healthy, loving and well-behaved kitten. We've had Yeti with us for just over three months and we couldn't be happier to have her in our lives! She's attached to all three of us equally, from day one feeling comfortable enough to crawl into my lap purring and sleeping by my side. Always eager for our attention, she listens attentively and follows us from room to room. 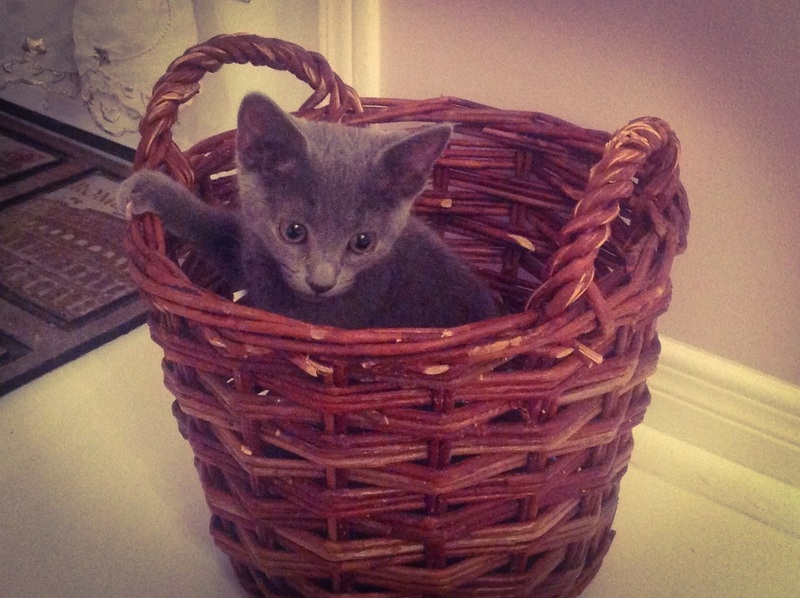 Yeti is an incredibly sweet and playful kitten, full of character, who loves to fetch and play with all her toys. She's very gentle, only using her nails on her scratching post and has always used her litter box. Her wonderful nature, good behaviour and great health is a testament to your early influence and attention to detail as a caregiver and for that we are so grateful to you! I've attached some pictures of her, but if you want more, just let me know! We have plenty of photos, especially of her sleeping and the ridiculously adorable positions she's able to find herself in. It has been a little over 2 months since we brought Indie home and she has been such a joy to us! She is the cutest little kitten, and so playful and affectionate. She has been absolutely perfect! We've heard horror stories from other friends/colleagues about their cats like scratching the furniture, climbing the curtains, or not using the litter box. For us, we've had no such problems. The minute we brought her home she was exploring her environment and started playing with some toys. She immediately knew how to use her litter box and scratching post, and on the first day came to us willingly to sleep on our laps. It has been an easy transition. Chris - thank you so much for raising the cats so well. We see the difference that a great breeder makes. We hope you had a wonderful Christmas. We wanted to let you know that Stella is doing very well. She makes a fantastic companion, she follows us in our routines and is very playful. We just came back from the vet where she had her vaccine administrated. 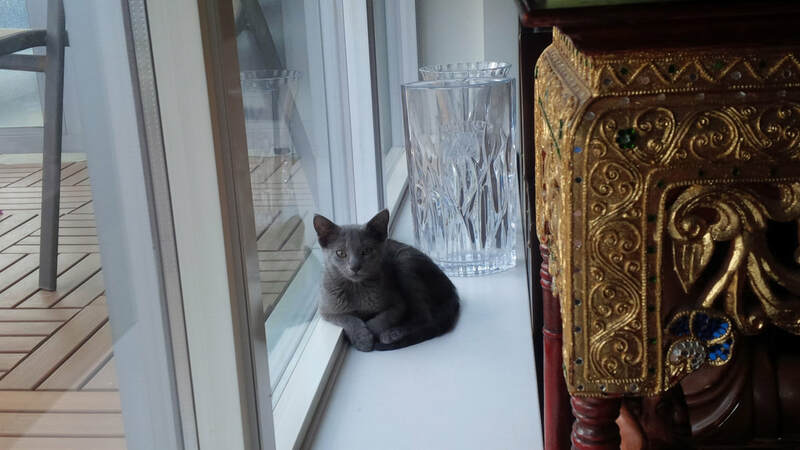 We are very happy to have her, she is a beautiful example of the Russian Blue kitten. Should someone ask you for references please do not hesitate to contact us in the future. Have a wonderful New Year 2014! We will be in touch. Danuta, Rafael, Natalie and Stella. I am sending you this email to say Thank You! Boris & Natasha so well integrated into a new home that it is spectacular. We finally figured out after the first day to tell them apart as they are either moving at 100 mph or dead to the world. Natasha’s fur color is a more solid blue while Boris actually has 3 lighter stripes on his back (like a chipmunk). While he is a little bigger than her, this is how we quickly ID which one is which without their collars. 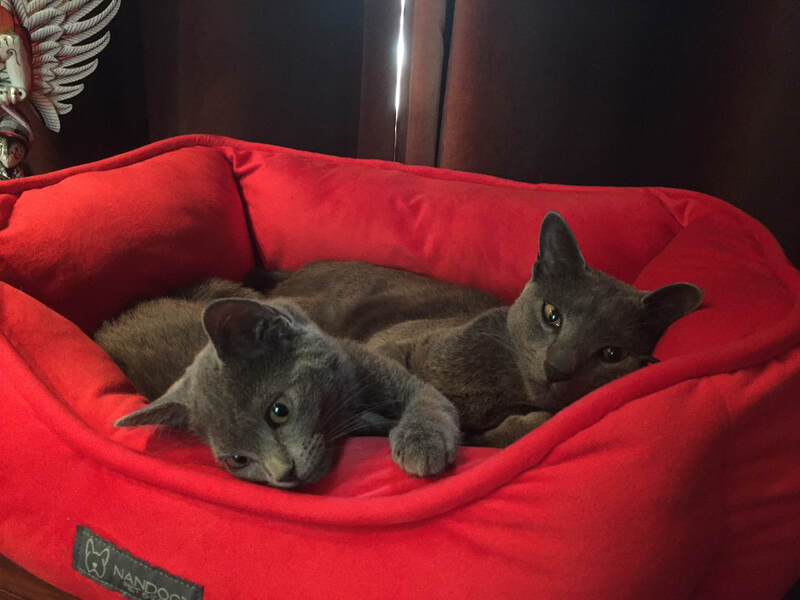 They are adjusting well and love each other for company – they are constantly chasing things and wrestling with each other….or sleeping cuddled up together. It’s amazing how well they get along together. It totally makes the decision to get two of them the right one! BTW – He’s got quite the devilish streak in him as well and will not be outdone by his sister….although she is just a little bit sneakier. They have a Twitter account Boris&Natasha and 49 cat followers already from around the world (literally the furthest one away is Melbourne, Australia). Thanks again for the great job at being their first human Mom! It shows.